Will this pounding and ringing in my ears ever stop? Does everything sound muffled? Am I losing my hearing? What can I do? For thousands of years Ear Detoxification, a form of hygiene, has been used as a way of naturally cleansing the inside of the ears and head. Today, more and more people are seeking alternatives to clearing their ears other than using Q-tips or using hydrogen peroxide to flush the ear canal. Ear Detoxification is a natural, safe and effective way of gently removing the wax, yeast, debris and micro-parasites that reside in the body's sinuses and ear canals. The procedure is non-invasive and Ageless Aesthetics MediSpa in Ashland, KY takes the utmost care and caution. 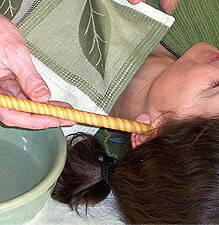 This treatment is great for people suffering from headaches, sinus infection, itchy ears and vertigo.